I USED ONE DISH AND COOKED IT IN THE MICROWAVE – THE RECIPE CALLED FOR SAUTEING THE ONION AND GARLIC IN A NON-STICK SKILLET THAT IS SUITABLE TO PUT UNDER THE BROILER BUT ALL MY SKILLETS HAVE PLASTIC HANDLES!! THEY MIXED EVERYTHING IN A LARGE MIXING BOWL THEN RETURNED THE MIXTURE TO THE SKILLET COOKING WITHOUT STIRRING ABOUT 10 MINUTES UNTIL SET. THEN THEY PLACED THE SKILLET UNDER THE BROILER UNTIL BROWNED. EITHER WAY YOU DECIDE TO COOK IT, YOU’LL LOVE IT! 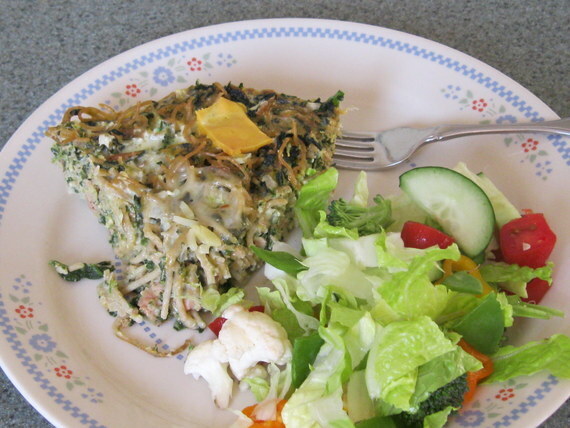 I HAD LEFT OVER SPAGHETTI NOODLES SO I THREW THEM IN A 10″ GLASS PIE PLATE THAT I SPRAYED WITH NON-STICK COOKING SPRAY. I MIXED EVERYTHING IN THE PIE PLATE, COVERED WITH WAXED PAPER AND COOKED IN THE MICROWAVE ON HIGH 10 MINUTES UNTIL SET IN THE MIDDLE (ABOUT EVERY 2 MINUTES I WOULD STOP AND STIR A TOUCH). IN THE LAST 2 MINUTES I ADDED A SLICE OF AMERICAN CHEESE BROKEN INTO 8 PIECES AROUND THE OUTSIDE EDGE FOR A BIT OF COLOR! IT WAS EASY TO CUT INTO 6 WEDGES AND SERVE WITH A FRESH SALAD! MY HUSBAND THOUGHT SOME FRENCH FRIED ONIONS WOULD REALLY SET IT OFF SO NEXT TIME I’LL MIX SOME IN AND THEN LEAVE SOME ON TOP TO GET CRISPY! GOOD IDEA HUBBY! FROM A BOX – UNBELIEVABLE! PREHEAT OVEN AT 350 F. STIR EVERYTHING TOGETHER AND POUR INTO GREASED LOAF PAN. BAKE 50-55 MINUTES. WHY WOULD I TRY TO MAKE SOMETHING FROM SCRATCH WHEN THIS IS SO GOOD?! I COULD ADD SOME NUT BUTTER FOR PROTEIN AND WHAT IS BETTER THAN PEANUT BUTTER AND CHOCOLATE. MY HUSBAND IS LIKING IT FOR NOW IN THE TOASTER OVEN HEATED JUST ENOUGH TO MELT THE CHOCOLATE CHUNKS FOR A DESSERT KIND OF BREAKFAST! ANOTHER MEATLESS MEAL FOR YOUR LENTEN FRIDAYS! 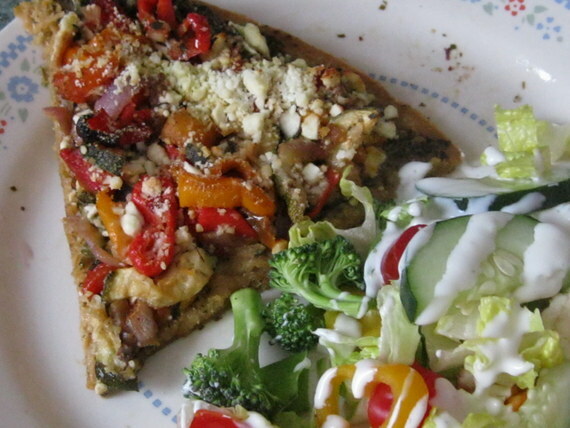 Spread pesto onto crust. Add veggies and cheeses and a drizzle of dressing. Bake another 5-10 minutes. SERVE WITH A BIG FRESH SALAD! 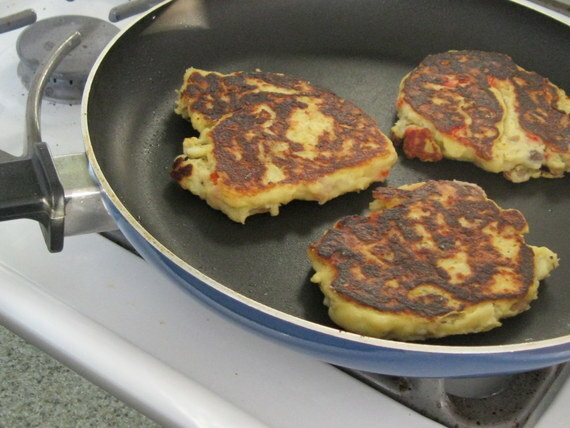 POTATO LATKES CAN BE MADE LOW FAT AND MAKE A HEARTY BREAKFAST! *I THINK FROZEN HASH BROWNS WOULD WORK WELL TOO IF YOU’RE PRESSED FOR TIME! 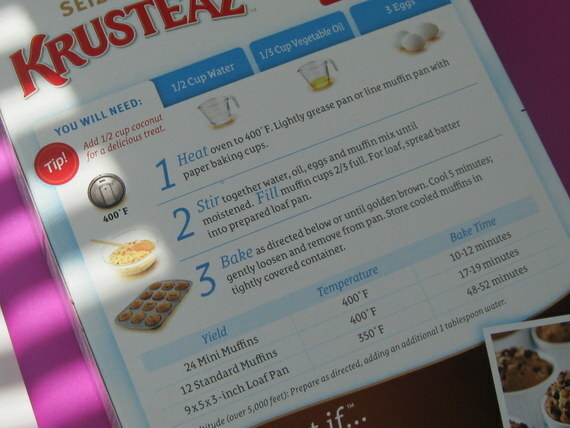 Add first 6 ingredients to a large mixing bowl and mix well. Fold in the vegetables – the batter will be thicker than pancake mix. Coat a large skillet with non-stick cooking spray and place on medium high heat. Place large scoops of batter (about 1/2 cup each) onto skillet and flatten somewhat (Mine made 4 large latkes). Cook about 5 minutes each side turning carefully. I FROZE MY LATKES WITH A PIECE OF WAXED PAPER BETWEEN THEM. THEN I CAN TAKE ONE OUT ON THE WEEKEND AND A TURKEY SAUSAGE BREAKFAST LINK AND MICROWAVE A SATISFYING BREAKFAST IN JUST A FEW MOMENTS. SOMETIMES I LIKE TO ADD KETCHUP OR A LITTLE SALT AND PEPPER. MY HUSBAND HAS A WAY WITH WORDS! I PUT THE SAUSAGE, GARLIC, ONION, SQUASH AND CHICKEN BROTH IN MY CROCK POT AND COOKED ON LOW 5 HOURS. THEN I CUT UP THE SAUSAGE AND RETURNED IT TO THE POT AND STIRRED IN THE BASIL. COOK THE PASTA AS DIRECTED (OR YOU COULD TRY THE NO WAITING FOR IT TO BOIL METHOD (http://wp.me/p3CD01-xw) AND DRAIN. 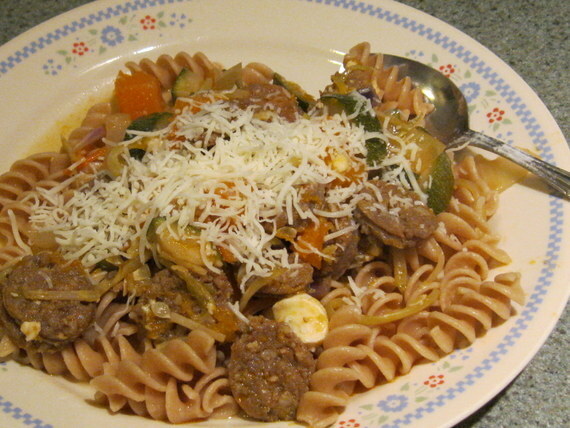 SERVE THE SAUSAGE MIXTURE OVER NOODLES AND TOP WITH SHREDDED CHEESE. THIS RECIPE ALSO CALLED FOR SALT AND PEPPER TO TASTE BUT WITH THE HOT SAUSAGE THERE WAS NO NEED FOR IT. I ALSO ADDED A MEDIUM ZUCCHINI THAT I NEEDED TO USE OR LOSE. EXCELLENT WITH A BIG FRESH SALAD! PLACE EVERYTHING EXCEPT TORTELLINI IN A BIG SOUP POT. BRING TO A BOIL THEN COVER AND REDUCE HEAT TO LOW. SIMMER FOR 45 MINUTES. 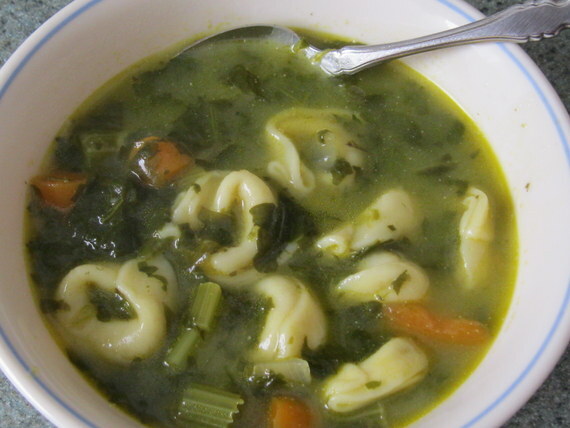 BRING HEAT TO HIGH AND ADD TORTELLINI. COOK FOR ABOUT 5 MORE MINUTES AND SERVE!! Mix together mushrooms, spinach, onion and cheeses in a large mixing bowl. Add egg and mix well. Scoop about 1/4 c of mixture in the middle of each chop. Roll up and fasten with a toothpick. Place in the bottom of the crock pot. Add about 1/4 cup of the chicken broth. Cook on LOW for 4 hours. 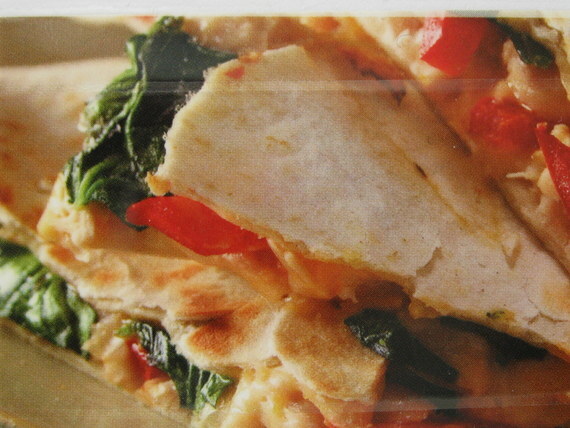 In microwave safe bowl combine chicken broth and cream cheese cook on HIGH 1 minute and stir or whisk. Cook on HIGH another minute or until cream cheese melts and creates a creamy sauce. I SERVED THESE CHOPS WITH LONG GRAIN AND WILD RICE TO WHICH I ADDED ANY LEFT OVER SPINACH AND MUSHROOM STUFFING I HAD, GREEN BEANS AND A BIG SALAD. THE SAUCE WAS DELICIOUS AND SPICY OVER THE CHOPS AND RICE! IT WOULD HAVE BEEN PRETTY AND FUN TO MAKE SOME BAKED APPLE SLICES WITH THIS DISH AS WELL! Place apple slices in a baking dish. Lightly spray with non-stick cooking spray. Sprinkle with cinnamon and sugar. Bake in 350 F oven for about 10 minutes so they are still crispy. I had a few sliced pecans that I added but walnuts and/or raisins woould be great too! Preheat oven at 350 F. In a medium mixing bowl, lightly mash beans. Stir in next 4 ingredients. Evenly sparead tuna mix over 2 1/2 tortillas laid out on 2 cookie sheets sprayed with non-stick spray. 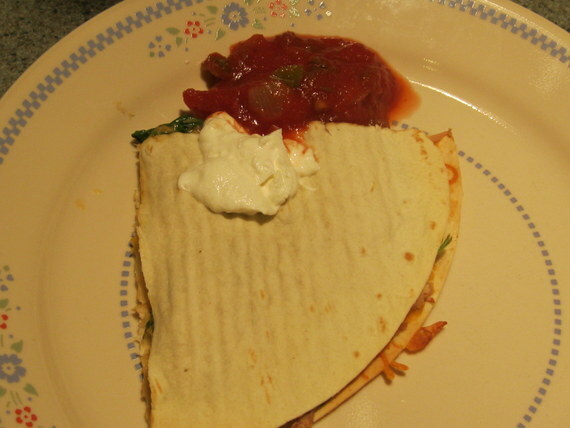 Top with cheese, spinach, peppers and remaining tortillas. Lightly spray tortilla tops with non-stick spray and bake for 15-20 minutes until golden brown. Cut into quarters and serve with salsa and sour cream. ALSO SERVED WITH A FRESH SALAD! 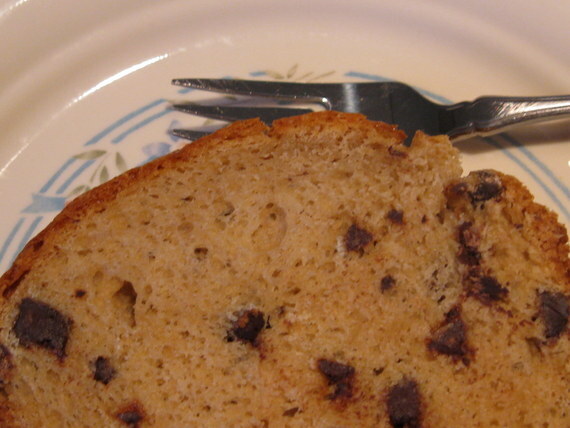 MEATLESS FRIDAYS IN LENT REQUIRE LOTS OF NEW IDEAS! In a large mixing bowl place sweet potato chunks into 1-2 cups of hot water. Microwave on high 10-15 minutes until soft enough to mash. Mash up and add the drained tuna. Add eggs and mix well. Add bread crumbs, baking mix, ranch dressing mix and pesto. Mix well. Mold into 4 large burgers (I use a round plastic container). 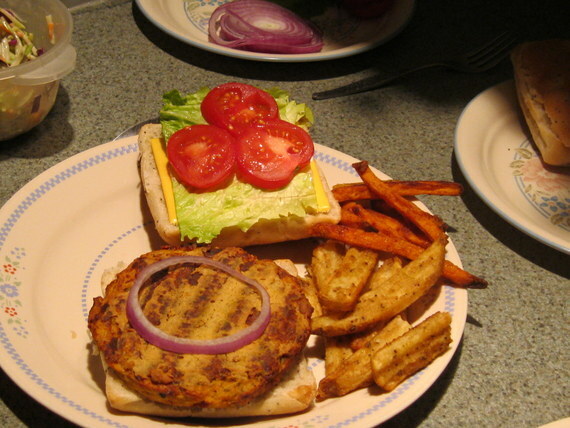 Place burgers on a preheated George Forman Grill or preheated skillet sprayed with non-stick spray. Grill 5-8 minutes each side (the George Forman Grill cuts cooking time in half as it grills both sides at once). ADD LETTUCE, TOMATO, PICKLES,MAYO OR TARTAR SAUCE. I SERVED ON A CIABATTA ROLL WITH SPICY BAKED FRIES (I HAD A COMBINATION OF SWEET POTATO AND WHITE POTATOES FOR THE FRIES) AND STEAMED LEMON DILL BROCCOLI SLAW. Place all ingredients in a microwave safe bowl and mix well. Microwave on high about 2 minutes – I like to keep my slaw on the crunchy side so I only nuke it until it is warmed not hot and limp.